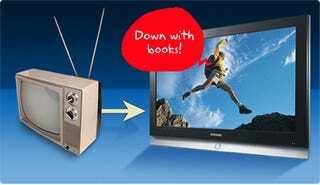 Is It Right That the U.S. Government Spends More on the Digital TV Switch Than Literacy Education? To be honest, I can't say that I am surprised to hear that the government has allocated $1.5 billion to inform 17 million citizens about the digital TV transition. After all, those uninformed few would undoubtedly take up arms if they missed out on sports broadcasts and NBC's Thursday lineup. However, I was a little surprised to hear that the total proposed budged for literacy education in 2009 stands at a paltry $574.6 million. Once again it seems that our government does not have its priorities in order. That having been said, does this represent a proper allocation of taxpayer money in your opinion? How does broadband access fit into the mix?